President Gurbanguly Berdimuhamedov, who made on 23-24 April 2018 the state visit to the Republic of Uzbekistan, and President Shavkat Mirziyoyev attended the ceremony of opening of the Turkmen-Uzbek Friendship Centre in the administrative centre of Khoresm region – Urgench. Before the opening ceremony, the leaders laid flowers to the monument of the great Turkmen poet – Magtymguly Fraghi. Deputy Minister of Culture of Uzbekistan K. Akilov greeted the leaders of the two states at the front entrance to the Turkmen-Uzbek Friendship Centre, erected in the Turkmanlar Mahallasi and invited them to enter the building. President Gurbanguly Berdimuhamedov and President Shavkat Mirziyoyev got acquainted with the collection of literature in the library that keeps the books on the history and modern time of the two neighbouring states as well as the Turkmen leader’s scientific works. The painting telling about the history and the present day of the two fraternal peoples were exhibited in the exposition hall. There is a conference hall in the building to host various forums. Continuing the state visit to Uzbekistan, Turkmen leader Gurbanguly Berdimuhamedov accompanied by his Uzbek colleague Shavkat Mirziyoyev visited Khiva located on the left bank of Amudary River in the south of Khoresm Region. This unique city museum received the status of sanctuary in 1967 and in 1990, the UNESCO declared Ichan- Kala district of Khiva as historical monument of the word significance. The Heads of Turkmenistan and Uzbekistan visited historical complex Ichan-Kala where traditional style of oriental city is preserved. The complex includes around 60 facilities like Kunya-Arc Stronghold, Tash-Hauli Palace, famous Juma Mosque with 213 carved columns , the symbol of Khiva Islam-Hoja Minaret and many other. During the tour around historical site, which is usually full of tourists, Turkmen leader said about the idea of making Turkmen – Uzbek movie, which can be made in this place as our nations have many common pages in their rich biography. The Heads of the States looked around Shirgazy Madrasah where famous poets and scientists of the East received their education. Classic of Turkmen poetry Magtumguly Fragi was also studying in his time in this madrasah. He wrote: “The golden book was opened for me here. I’m sorry but I leave, beautiful Shirgazy”. Ancient books including Turkmen poets Magtumguly, Kemine, Seydi, Zelili and other were demonstrated to the leaders. This is just a small part of huge layer of Turkmen culture that remained and expecting for its study. President Gurbanguly Berdimuhamedov gave instructions to relative leaders of Turkmen delegation to work out on this subject and to organize the study of these priceless sources in Ichan-Kala, which can tell a lot about the history of Turkmen nation. 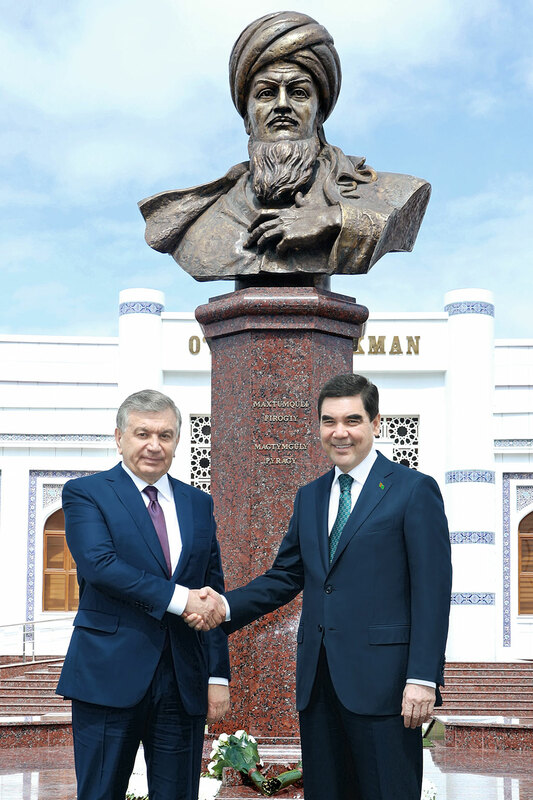 Screenplay dedicated to one of the pages of artistic biography of Magtumguly was presented to the Presidents of Turkmenistan and Uzbekistan in the yard of the madrasah. The programme of Turkmen leader in Khoresm region includes the visit to Mahmyda Palvan Mausoleum, which is one of the most wonderful samples of Khiva architecture of XIX century and historical palace complex Nurullaboy in the outskirts of Khiva. At present day, owing to the work of restorers and historians, the fortress became one of tourist centres of Urgench region attracting the travellers who want to stay in real environment of the past centuries. The guests of Uly Howly can have a horse ride, see the flour production at mill and try different national dishes. National games, kurash wrestling competitions and artists performances are also held in this tourist place. At the site, the Heads of the states were cordially welcomed by Chairman of Turkmen – Uzbek Friendship Association of Khoresm D. Rajabov, local elders and children who read out the poems in Turkmen and Uzbek languages. Turkmen and Uzbek Leaders had a look around the craft workshops and numerous exhibits that recreate the life features of the residents of ancient Khoresm. Traditional yurtas “ak oyi” are placed in the yard of architectural complex. Samples of Turkmen carpets are also presented there. The history of Turkmen fortress with eight meter height and one and half meter width clay walls is more than 300 years. Ancient traditions and rites, national dances and songs performed by the band of Turkmen – Uzbek Friendship Association come to life in all its richness and variety in interior yard. Ahalteke horses including those that took part in various competitions and tournaments were demonstrated to high-rank guests. By the way, local horse breeders - the members of International Ahalteke Equestrian Association, who continue ancient traditions will come to the session of this organization in Ashgabat as well as will take part in the events on occasion of the Turkmen Horse Day. After the tour around Uly Howly Fortress, Presidents Gurbanguly Berdimuhamedov and Shavkat Mirzyoyev expressed the gratitude to the participants for the excursion and went together toward Hiva where they also would visit historical and cultural sites. KASHMIR JOINT RESISTANCE LEADERSHIP AND KASHMIR DIASPORA LEADERSHIP JOINTLY STRESS THE COMMONWEALTH TO ENGAGE IN THE KASHMIR ISSUE AND AT ONCE ADDRESS THE DETERIORATING HUMAN RIGHTS SITUATION IN INDIAN OCCUPIED KASHMIR. ‘ASIFA INNOCENCE RAVAGED’ CAMPAIGN LAUNCHED AT THE ROADSIDE ROUNDTABLE IN PARLIAMENT SQUARE, LONDON.